I learned a tremendous life lesson when challenged with how to organize Legos. I know how cheesey that sounds but it’s true. My 5-year son taught it to me. The Lego obsession in our house is in full swing. My kids are in love. The problem is, my house has become an unwelcome and constant scavenger hunt for pieces. I’ve found Lego heads under couch cushions, pieces in the vacuum, and little hands and wigs in the oddest places–once even in our dishwasher! I knew I didn’t want to be ‘that parent’ trying to control how my kids play with their toys, but at the same time, I just could not sign over our home to Legos for the next decade. One day, while searching on Pinterest for solutions, my son peaked over my shoulder and asked what I was doing. I told him I was looking for cool ideas on how we could organize Legos so he doesn’t lose the pieces. To my surprise, he thought this sounded like a fun project. “Ooh, can I help? !” he asked. And then it dawned on me. YES. What if I make him part of the solution instead of the problem? What if I could somehow show him that organizing is fun? I thought it was worth a shot. I whispered to my husband my hidden agenda and he laughed. He didn’t believe my son would be interested in this activity for more than 10 minutes. First, we went all through the house collecting Lego guys and body parts. We made it a game and tried to see who could find the most. Then, we dumped all the Lego guys on the counter to review our inventory. Seeing them all together in one place got my son excited. It turns out we had a lot more than either of us thought we did! So far, so good. He was totally into the project so far. Off to The Container Store we went to organize Legos. We got a cart and walked through every single aisle. I told him to stop me if he saw a container that he thought would work to store his “guys” or if he had a creative idea. Row by row, his imagination was hard at work. We looked at containers with lids, no lids, with handles, with wheels. You name it–we considered it together. This was probably our longest shopping trip together. He was totally engrossed in our project. I couldn’t believe we were having a “moment” bonding over the joy of organizing, but that’s what it was. We spent most of the rest of the afternoon working on this project together (with his 3-year old brother pitching in–kind of). We had music on and no TV; I just wanted to see if he would ask about watching TV and he never did. 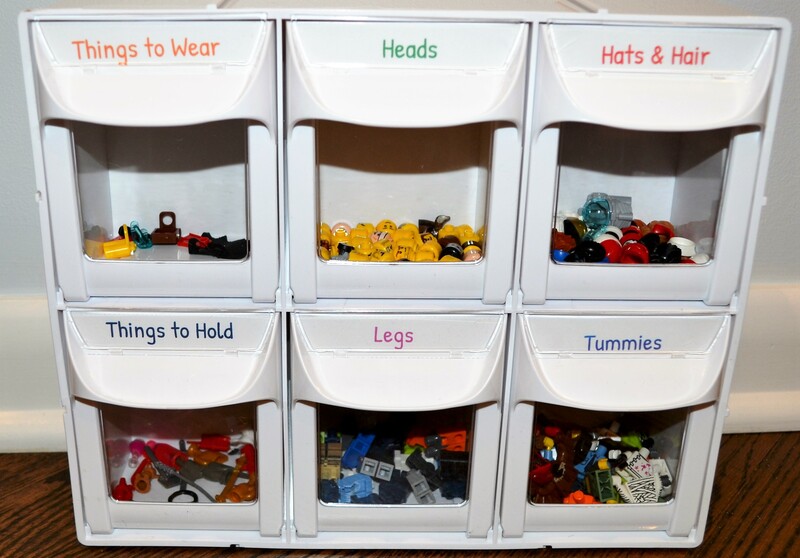 He came up with the titles for all the categories on the Lego guy container–my favorite is the “tummies.” We sorted and made piles together and then color sorted it all. My son was fully geeked out when we were finished. I mean bouncing off the walls and excited about what he had done. This project was a victory on many levels. For one, we found what we were looking for and my son was proud and excited about what he had figured out. He gained a lot of confidence from realizing he had good ideas and was able to do a project that seemed like it might be too difficult initially. I haven’t found any Lego body parts in the dishwasher in weeks! We’ve been able to do some of the Lego kit projects that we abandoned in the past because we couldn’t find the parts we needed. 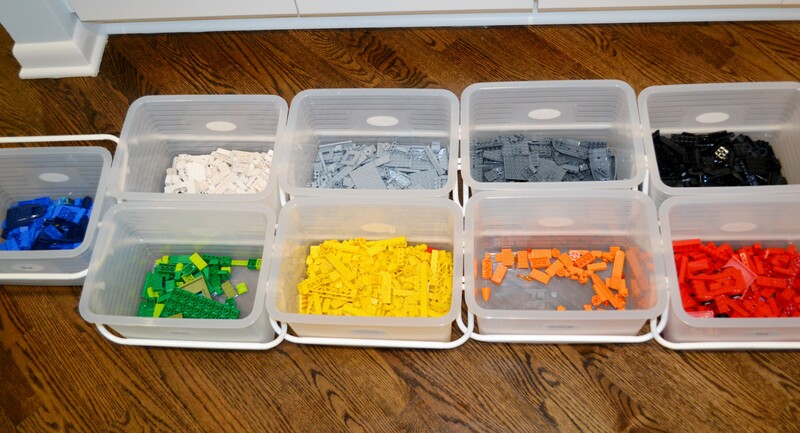 And my entire family is very glad that we’ve ended the circular discussion I had been bringing up for so long about how we needed to organize Legos! Want to talk about Legos more? Visit us on Facebook or contact us! And that’s my story about how I multi-tasked family bonding and the compulsion to organize Legos!